Nature Made Multi for Her 50+ Liquid Softgel has 22 important key ingredients that are specially formulated for daily nutritional assistance for women over the age of 50. Nature Made Multi for Her 50+ helps support bone and teeth health, promotes a healthy immune system, has antioxidant activity, has cellular energy production with 8 B vitamins, promotes eye health, promotes healthy red blood cell formation and has folic acid. It also has 6 other vitamins and minerals for daily supplement and has high iron content which is needed for post-menopause. The recommended intake is one soft gel capsule a day with meals. It is also recommended that the person who will take it should be 18 years old and above. The website does not provide any information on the product’s price or any money back guarantee. 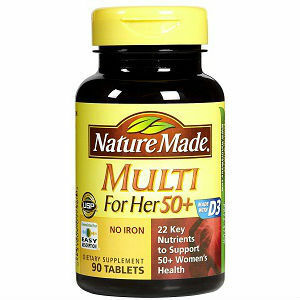 Nature Made Multi for Her 50+ is a multivitamin supplement and may not be considered as something that would really help and focus on menopause symptoms. You can take this with another supplement that is especially done for menopause problems which means that you have to spend extra. Jackie Horowitz	reviewed Nature Made Multi For Her 50+	on March 26th	 and gave it a rating of 2.